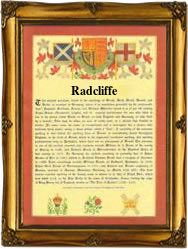 Recorded in the spellings of Radcliff, Radcliffe, Ratcliffe, Radclyffe, and Radecliffe, this surname is of pre 7th century English origins. It is a locational name from the various places in England such as the villages of Ratcliffe in the counties of Leicestershire and Nottinghamshire, Radcliffe in Lancashire and Nottinghamshire, Redcliffe in Bristol and Warwickshire, Radclive in Buckinghamshire, and Rathclyffe and Rathcliffes in the county of Devon. The place name and hence the later surname, derives from the Old English word 'read' meaning red plus 'clif' meaning a cliff or sometimes a riverbank. The surname is very early and dates from the late 12th Century (see below). Early examples of recordings taken from surviving rolls and registers of the medieval period include: William de Radeclive of Lancashire in 1272, and Willelmus de Radclif in the Poll Tax records of Yorkshire in 1379. Later examples include John Ratcliffe, the son of Anthony Ratcliffe, christened at the church of St. Bartholomew Exchange, in the city of London, in 1569, and James, the son of Thomas Radcliffe, christened at St. Margaret's, Westminster, on June 25th 1634. The first recorded spelling of the family name is shown to be that of Walter de Radeliva. This was dated 1182, in the Pipe Rolls of the county of Devonshire, during the reign of King Henry 11nd of England, 1154 - 1189. Surnames became necessary when governments introduced personal taxation. In England this was sometimes known as Poll Tax. Throughout the centuries, surnames in every country have continued to "develop" often leading to astonishing variants of the original spelling.